The British Folland Gnat light jet fighter was evaluated also by the RAF, but only its two-seat trainer version known as the Gnat T.1 entered the RAF service. The flight tests of the F.1 version took rather long time during which various colour schemes were applied to the machines. The most attractive of them are presented in our superbly detailed model, which as you most probably already know is injected within steel moulds. The decal sheet brings you also markings for so-called Oscar EW-5894 Phallus fictional machine famous from an early 90´s spoof of heroic aviation movies. The model itself comes with three sprues with plastic parts, one clear plastic sprue and contains also a couple of resin parts for various antennae and air intakes that were characteristic for pre-production and trial machines. The kit´s sprues (depicting fuselage with sheet-metal covering and the first type of the wings) come with Cartograf printed decals and full-colour instruction sheet which cater for four Czechoslovak airframes, one of which in three various colour versions. That machine is interesting for a dedication on its fuselage. All machines carry badges of their respective Air Regiments. Empennage of one of the machines was painted in off-white for recognition purpose during a military excercise, another machine´s cowling was adorned with a Felix the Cat cartoon which was an unofficial badge of the squadron. Only the small parts and the clear parts are common for this kit and the previous one – SH72145. The fuselage is of a later type with fabric covering of its dorsal section, the wings are of the second used type. This kit´s decal sheet also originates in Italian Cartograf and brings, together with full-colour instructions marking and camouflage options for three Slovak aircraft. Two of those carried a later type of Slovak national insignia and yellow recognition segments typical for the Eastern Front. The third machine carried original national markings of the Slovak State accompanied by German marking as the machine was involved in the Polish campaign and the German marking should serve to protect the Slovak machines from being shot down by Luftwaffe planes or Wehrmacht anti-aircraft fire. Following the 1/72 scale model, its bigger brother in 1/48 scale is now also available and we would like to accentuate that the kit benefits from excellent detail throughout. It is also injected within steel moulds and can be built with a fuselage nacelle or with just the basic fuselage framework exposed. The decal options offered are for three Czechoslovak machines, a Polish one and the last option is for a glider that flew in East Germany. The same set of sprues is present in the second boxing and its decal sheet offers markings of the type´s biggest user, Nazi Germany. To make the choice more colourful, there are also three Slovak machines one of which also flew in the post-war era. The Czechoslovak L-39 Albatros jet aircraft was a standard training machine of the Warsaw Pact and was also exported to many developing countries of the third world. When the Soviet Union and the Eastern Block had collapsed, the plane went on being used and it continues doing so until these days, interestingly also in new NATO member countries. The avionics of the machines used in the Czech Republic and Slovakia was modernised and those machines are known as the L-39CN. SH48171 kit contains three runners with plastic parts, vacuum-formed canopies, resin parts and photo-etched parts. The decal sheet offers one Czech and one Slovak L-39CN machine and also a highly attractive and colourful Estonian aircraft. This limited edition model brings you the very last version of the P-47 Thunderbolt that was used in the ETO by the 56th Fighter Group. The original Academy plastic parts are complemented by a new runner with plastic parts for the interior, new four-part engine and two styles of the fin root fillet. The kit also contains new detailed resin wheels, high-volume external tanks and PE parts for air brakes. The decal sheet caters for five highly attractive machines from all of the 56th FG´s three squadrons. For the new Gnat T.1 model made by Airfix, several various and detailed resin sets have been prepared. The first of them is this exquisitely detailed set of undercarriage bays. It brings much more detail to those areas than the original kit. New u/c doors are also contained in the set. Neatly detailed resin set of open air brakes intended for the new Revell´s model. The decal sheet provides for eight options of Czechoslovak Škoda PA-II Želva (Turtle) armoured vehicle. Designed to fit the new Tacom´s injected model. 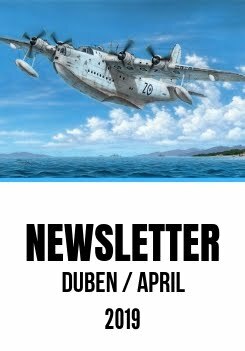 Our new 1/48 models of Italian WW2 IMAM (Romeo) Ro.43 and Ro.44 floatplanes all of which are produced under Special Hobby label would benefit from addition of the resin cast beaching trolley. It could be used also with another Italian seaplanes. The trolley consists of the main framework, wheels and bracing struts. Finely detailed cockpit resin set made for the new Revell´s kit. It contains brand new cockpit tub, ejection seats, instrument panels, control sticks, side consoles and also a new front u/c bay floor. A pre-coloured PE fret also comes with the set. The set contains eight 25kg Italian bombs used by the Regia Aeronautica (Italian Air Force) during the Second World War. The set comes with three figures of German WW2 soldiers servicing an A4/V2 launch platform. The set contains a figure of an Austro-Hungarian artillery lieutenant from the WW1 era.